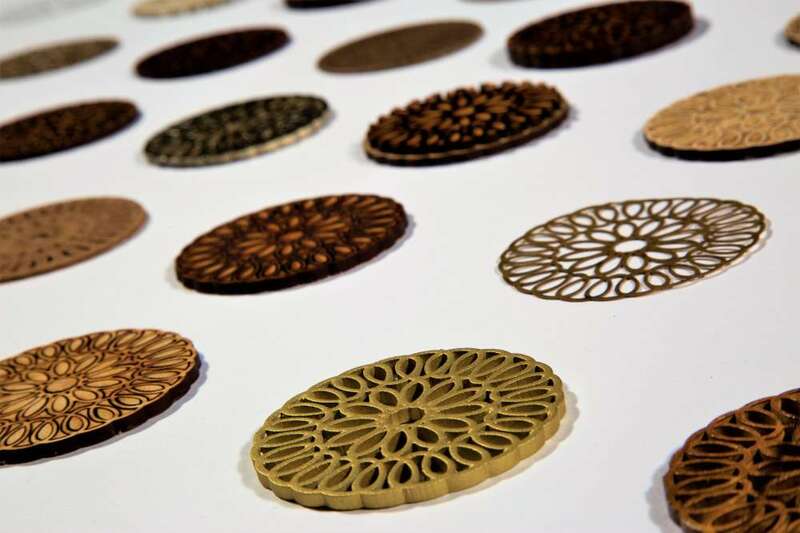 Inspired by intricate patterns and complex geometry, Sarah Charlton's work combines traditional handmade techniques with innovative digital technologies. 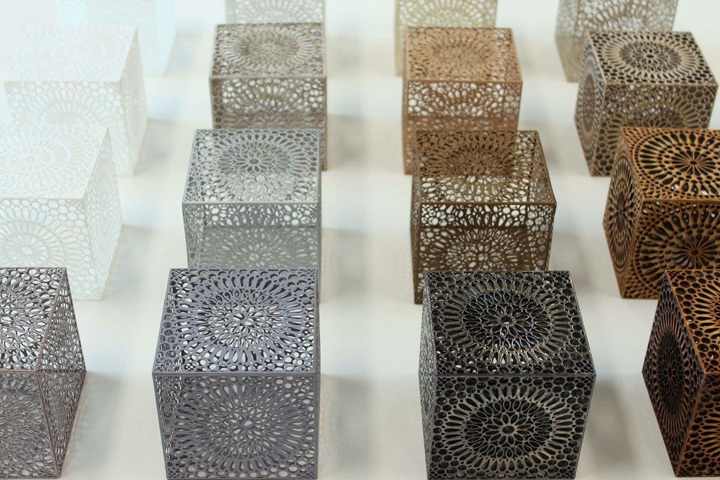 She uses laser cutting and 3D printing to create this collection of decorative cubes, in a range of materials including plastics, nylon, wood, card and paper, with applied finished. 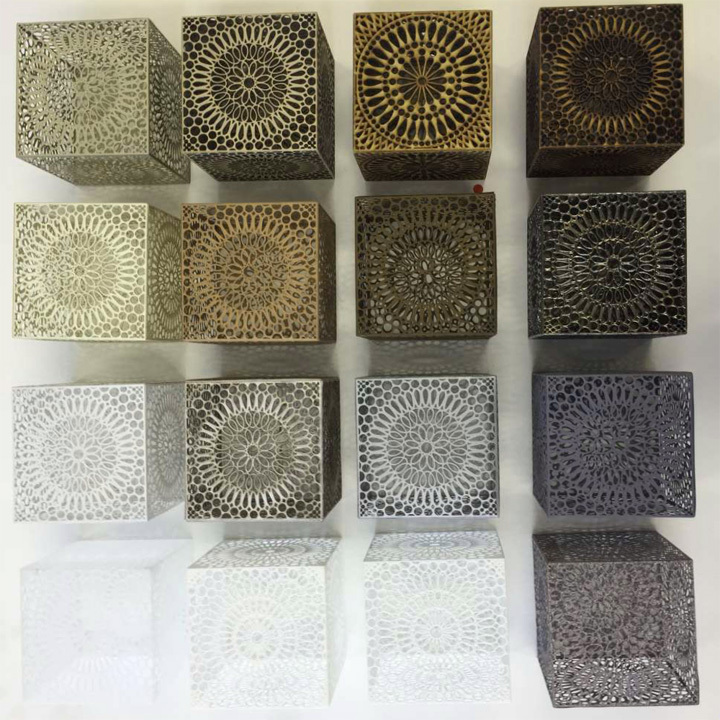 Each cube is slightly different, created with a different material and process of finish. The 'Samples Collection' comprises 36 selected pieces selected from 98 of Sarah Charlton's explorations of material, process and finish. Each piece is unique, ranging from acid etched copper, laser cut wood with hand stitched details, to 3D printed brass infused steel. 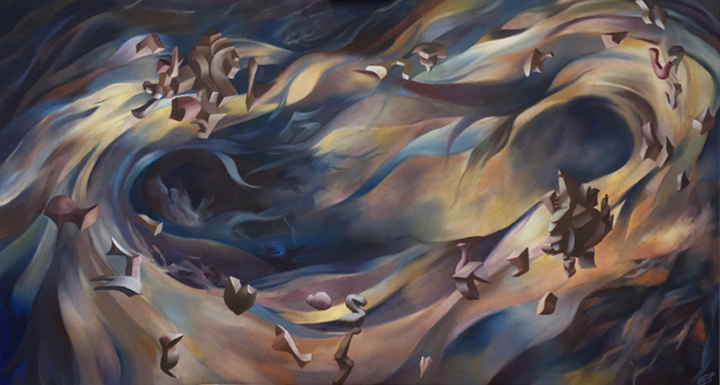 Fascinated by the intricacies of thought, Holly Kerslake's paintings depict the process of comprehension within onself. Unique experiences, knowledge and data are visualised as unique ‘building blocks’. 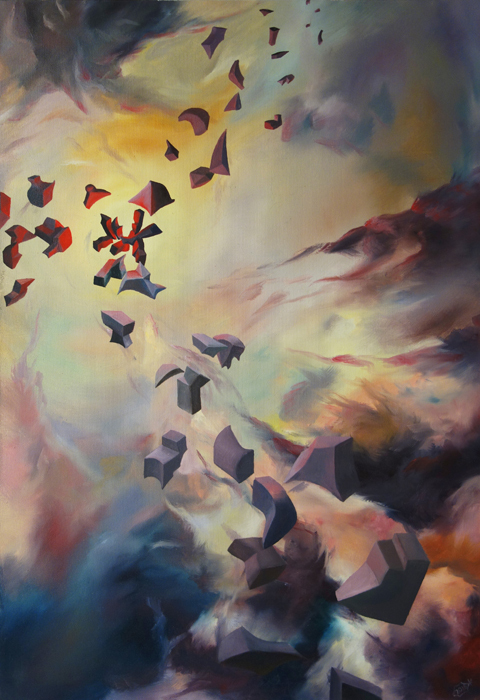 These shapes energetically fit together like a complex jigsaw, whose forms change as the perception of the data shifts – providing new understandings and interpretations. This visualisation derives from combined works by Noam Chomsky and James Carey, who drew parallels between the geographical transfer of verbal communication, and the workings of the mind. 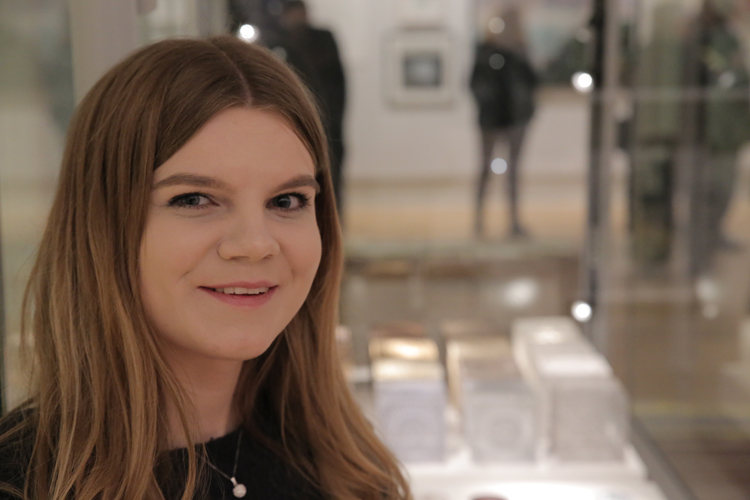 No Entiendo depicts the difficulties when communicating through language barriers,"says Holly. "The two cultural entities meet at the focal point, where the pieces collide in a harsh clash of cultural misunderstanding, rebounding in a heated state insinuating tension in the lack of coherence. The calm angelic scene, reflects the harmonies between tourists and locals where cultures can harmoniously link through awe and fascination." 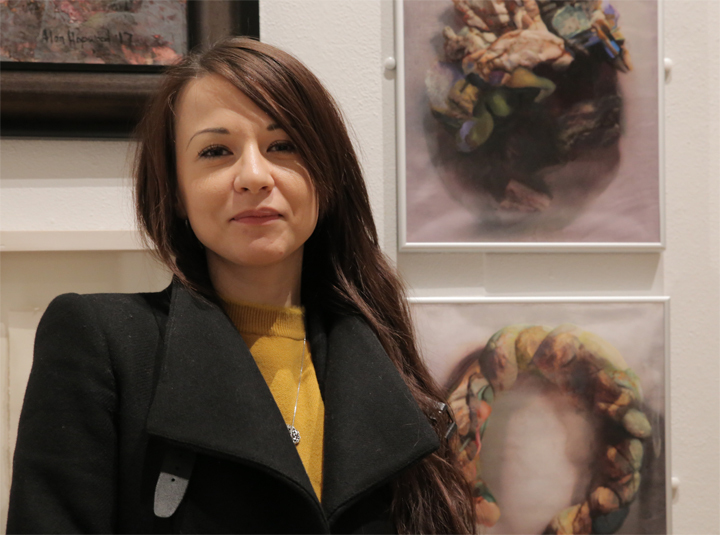 Stefania Laccu's research is rooted the field of painting and mental illnesses. Somatic Symptom Disorders (SSD) is a condition in which emotional distress such as anxiety affects the body, generating physical discomforts and pain; there is not a proper cure. 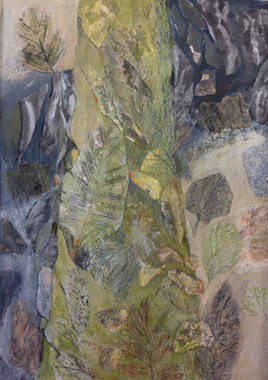 Her works embody the manifestation and the course of a somatic disorder within the body, through a technique she calls Overlapping. A range of chromatic effects are modified in tone according to the position adopted by viewer observing the painting, achieved by the daylight going through layers of acetates and reflecting on the metallic surface, which modifies the tonal perception of colour. The evanescent colour represent the transitional symptoms that affect the body during emotional states, such as irregular heart rhythm, shortness of breath, digestive disorder and generalised painful conditions. "My investigation presents the materiality of the medium of painting, its practice and quality of its surface as a human body, where somatic disorders are stored then manifested, say Stefania Laccu. "The incarnated memory of the experience of living with (SSD) generates what I call somatic identities, expressed in painting."